We offer our eligible members a comprehensive Health and Welfare benefits program, which includes medical, prescription drug and dental coverage and short-term disability benefits. Generally, you are eligible for the benefits described in the Summary of Benefits if you are a Wage Class I, II, or III member working for a participating employer who makes contributions to the Fund as the result of a collective bargaining agreement. Click here for a list of participating employers. 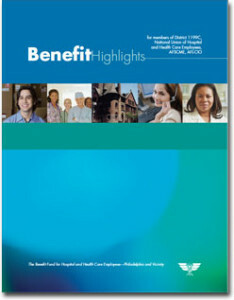 administrative fees for self-insured benefit plans. 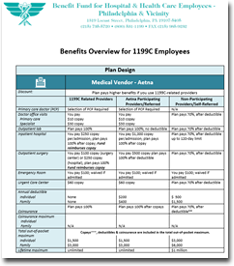 Member paid union dues are not used to Fund any 1199C benefits. Union dues are used strictly to pay for the functioning of the union and covers associated expenses for such things as salaries, maintenance of union offices, utilities, and recruiting efforts among other things. Click here to learn more about Union Dues.